The NBA’s free-agency season is back in full swing. More than $1 billion has already been spent, but there are still a few useful players out there looking for new teams. Restricted free agent center Montrezl Harrell has agreed to a two-year, $12M deal to return to the Clippers, agent Drew Rosenhaus tells ESPN. Forward Nemanja Bjelica has agreed to a three-year, $20.5M deal with the Sacramento Kings, league sources tell Yahoo. Third year will be non-guaranteed. Free agent Michael Beasley has agreed to a deal with the Lakers, league sources tell Yahoo. Rumor: Ferrell will become a free agent again only a day after reportedly agreeing to a two-year deal with the Mavs. Ferrell’s agent says he felt “uncomfortable,” but there was no further explanation as to why a new contract wasn’t signed. Sources: Guard Yogi Ferrell has changed course on Dallas Mavericks deal in order to reenter free agency. “We felt uncomfortable and will weigh our options,” agent Cervando Tejeda said. Rumor: Anthony was traded to the Hawks as part of a deal involving the Thunder and 76ers, but he won’t be staying in Atlanta. Atlanta is expected to waive Anthony, making him a free agent and paving the way for him to sign with the Rockets. It should surprise no one that @carmeloanthony has been telling people for more than a week that he’ll ultimately wind up with the Rockets, per league source. Free agent forward Dante Cunningham has agreed to a deal with the Spurs, league source tells ESPN. Free agent Dante Cunningham is finalizing a one-year deal with the San Antonio Spurs, league sources tell Yahoo. Free agent guard Shabazz Napier has agreed to a two-year deal with the Brooklyn Nets, league sources tell ESPN. Napier, 27, had his best pro season with the Blazers last year. Free agent James Ennis has agreed to a two-year deal with the Houston Rockets, league sources tell Yahoo. Deal includes player option in second season. Rumor: The Rockets reportedly offered Capela a deal in the four-year, $60 million range, not particularly close to what the restricted free agent expected. Capela is looking for a four-year, $100 million contract similar to the extension Steven Adams signed with the Thunder. #Bucks are signing Brook Lopez, per source. Forward Jonas Jerebko plans to sign with the Golden State Warriors upon clearing waivers on Monday, league sources tell ESPN. Jerebko has a $4.2M salary that would need to be guaranteed if he’s claimed. Restricted free agent center Jusuf Nurkic has agreed to a 4-year, $48M deal to stay with Portland, league source tells ESPN. San Antonio Spurs restricted free agent Kyle Anderson has signed a four-year, $37.2 million offer sheet with the Memphis Grizzlies, league sources told ESPN. RFA Zach LaVine has agreed to a four-year, $80M offer sheet with the Sacramento Kings, league sources tell Yahoo. The Chicago Bulls have 48 hours to match. The Bulls have decided to match Sacramento’s $78M offer sheet to Zach LaVine, league sources tell ESPN. Tony Parker has agreed to sign with Charlotte, league sources tell Yahoo. Free agent guard Ian Clark has agreed to a one-year deal to return to the New Orleans Pelicans, league sources tell Yahoo. Free agent Kyle O’Quinn has agreed to a one-year, $4.5M deal with the Indiana Pacers, league sources tell Yahoo. The Sixers are signing forward Nemanja Bjelica to the room mid-level exception, per source. Free agent guard Raymond Felton has agreed to a one-year deal to return to Oklahoma City, league source tells ESPN. Free agent forward Kevon Looney has reached an agreement to re-sign with Golden State, league sources tell ESPN. Devin Booker and the Phoenix Suns are progressing toward finalizing a 5-year, $158M maximum contract extension as soon as the weekend, league sources tell ESPN. Suns presented the offer to Booker in Los Angeles today. Utah Jazz restricted free agent Dante Exum has agreed to a three-year, $33M contract extension, league sources tell ESPN. Dwight Howard has finalized a buyout with the Brooklyn Nets and will sign a 1-year deal for the tax MLE with the Washington Wizards once he clears waivers, league sources tell The Athletic. Sources: RFA Raul Neto is signing a two-year, $4.4M deal to return to the Utah Jazz. Rumor: In search of some tax relief, the Nuggets will send Chandler to the Sixers, who can bring the forward into their cap space. Chandler averaged 10.0 points and 5.4 rebounds per game last season while shooting 35.8 percent from 3-point range. Denver has traded Wilson Chandler and a draft consideration to the 76ers, league sources tell ESPN. Chandler will be absorbed into the Sixers space. Wizards reach deal with @unclejeffgreen on a one-year minimum deal, per source. Will add depth after @mikescott departure to Clippers. Sources: Free agent Jeff Green has agreed to a one-year, $2.5M deal with the Washington Wizards. Michael Carter-Williams has reached deal with Rockets, source tells ESPN. Sources: Free agent Avery Bradley has agreed to a 2 year, $25M deal with the Clippers. Free agent DeMarcus Cousins has agreed to a deal with the Golden State Warriors, league sources tell Yahoo. Free agent guard Seth Curry has agreed to a two-year deal with the Portland Trail Blazers, league source tells ESPN. Deal — which guarantees him $2.75M this year — includes a player option on second season. Free agent Julius Randle has agreed to a two-year, $18M deal with New Orleans, league sources tell ESPN. Player option second year. Rumor: The Lakers freed up cap space by renouncing Randle, making the forward an unrestricted free agent. However, some of that space quickly disappeared with Los Angeles adding Rondo on a one-year deal. It doesn’t seem like the Lakers are done making moves just yet. The Lakers have renounced Julius Randle, making him an unrestricted free agent, league source tells ESPN. Sources: Rajon Rondo is signing a one-year, $9M deal with Lakers. Free agent Mike Scott has agreed to a one-year deal with the Clippers, league sources tell ESPN. Free agent forward Anthony Tolliver is nearing a one-year deal with the Minnesota Timberwolves, league sources tell Yahoo. Anthony Tolliver’s one-year deal is worth $5.75 million. Free agent Jose Calderon agrees to a one-year, $2.4 million deal with Detroit, league sources tell ESPN. The Orlando Magic has agreed to re-sign restricted free agent forward Aaron Gordon to a four-year, $84 million deal, a source told ESPN’s The Undefeated. Rumor: There have been rumors surrounding the Lakers and multiple stars for quite some time, but the Sixers should not be ignored. Philadelphia already has a group meeting with LeBron James’ agent, and now a trade for Leonard could be coming. Nothing is close to being finalized at the moment, but reports suggest Philly is confident it can acquire Leonard. The 76ers have engaged in talks with the Spurs on a potential Kawhi Leonard trade. The Dallas Mavericks will likely utilize remaining $5M in salary cap space to re-sign franchise cornerstone Dirk Nowitzki, league sources tell Yahoo. Nowitzki’s $5M team option was declined before start of free agency to give Dallas flexibility. Free agent Glenn Robinson III is finalizing a deal with the Detroit Pistons, league sources tell Yahoo. Source: Knicks have agreed to terms with C Luke Kornet on a one-year deal for $1.6M – his non-bird exception. Restricted free agent Fred VanVleet has agreed to a two-year, $18 million deal to return to Toronto, league sources tell Yahoo. Free agent guard Nik Stauskas has agreed to a deal with Portland, league sources tell ESPN. Rumor: The Lakers could be more aggressive in their pursuit of Cousins with Paul George off the board. The Pelicans would obviously love to have Cousins back working down low with Anthony Davis, but it will be interesting to see how much these teams are willing to spend on a big man coming off a brutal injury. New Orleans Pelicans All-Star free agent center DeMarcus Cousins received calls from the Pelicans and Los Angeles Lakers tonight once free agency began and is expected to have meetings scheduled with both teams soon, a source told ESPN’s The Undefeated. Free agent forward Omri Casspi has agreed to a one-year deal with the Memphis Grizzlies, league sources tell ESPN. Free agent Gerald Green has agreed to a one-year, $2.4M deal to return to Houston, league source tells Yahoo. Free agent guard Marco Belinelli has agreed to a two-year, $12M deal with the Spurs, league source tells ESPN. Sources: Derrick Rose has agreed to a one-year, $2.1M deal to re-sign with Minnesota. All-Star Chris Paul will sign a four-year, $160M max contract to stay with the Houston Rockets, league sources tell ESPN. Ersan Ilyasova has agreed to a 3 year, $21M deal with Milwaukee, league source tells ESPN. Joe Harris has agreed to a two-year, $16M deal with Nets, league sources tell ESPN. Doug McDermott has agreed to a three-year, $22M deal with Indiana, league source tells ESPN. Rumor: The Suns are looking at 3-and-D specialist Trevor Ariza in free agency as well as shooting guard Avery Bradley and power forward Julius Randle. Phoenix has some money to spend, so look for this team to be active. The Suns are interested in Rockets free agent forward Trevor Ariza, per sources. Avery Bradley and Julius Randle also mentioned as targets. The Suns can create around $18 million in salary cap space. DeAndre Jordan and the Dallas Mavericks have scheduled a 12:01 a.m. meeting to immediately launch into free-agent negotiations and are expected to quickly reach terms on a new deal tonight, according to league sources. Free agent forward Rudy Gay has committed on a one-year, $10 million deal to re-sign with the San Antonio Spurs, league sources tell Yahoo. Paul George has committed to sign a deal with the Oklahoma City Thunder, league sources tell ESPN. Gifted young center Nikola Jokic is poised to accept a five-year, $148M maximum contract to stay with the Denver Nuggets shortly after midnight, league sources tell ESPN. Will Barton, Denver will come to terms on a four-year deal just north of $50 million when free agency opens, sources tell @YahooSportsNBA. Free agent guard Will Barton and Denver intends to ink a four-year, $54 million deal, league sources ESPN. He will have a player option on fourth year. DeMarcus Cousins heading to the Lakers? Rumor: With Paul George closer to staying in Oklahoma City, the Lakers may chase Cousins. 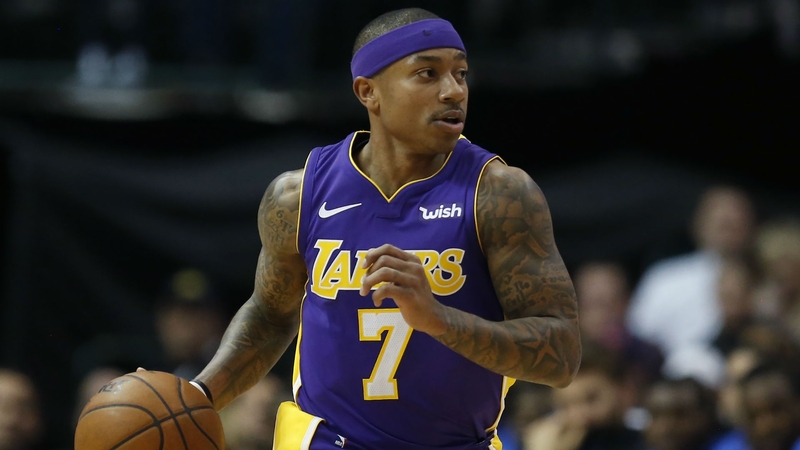 The four-time All-Star is coming off an Achilles injury, so a short-term deal with less risk could make sense for Los Angeles. Kevin Durant intends to sign a two-year max deal with a player option to stay with Golden State, league sources tell ESPN.